The re:p Bio Fresh Mask With Real Nutrition Herbs claims to soothe irritated, stressed and troubled skin with natural vegan-friendly ingredients that gently peel away trapped impurities and soothe irritations for supple and softer skin. Following water in the formula is Kaolin, included because of its detoxifying effect brought on by strong absorption capabilities. Kaolin is able to draw out impurities, excess oil and dirt to achieve clear skin and clean pores, making it ideal for oily and acne-prone skin. Rich in vitamin E and K, Canola Oil helps to soothe the skin by easing acne, blemishes and even fine lines. Antioxidants protect from free radical damage for a more youthful appearance. 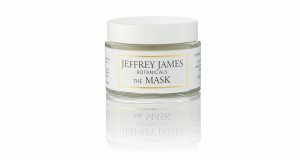 It’s often used as a base in moisturisers and lotions to keep skin supple and glowing. A whole host of botanical extracts are included for their soothing, calming and protective impacts on the skin. Rosemary Leaf Powder and Lemon Balm Water have antioxidants to protect against environmental stressors while the presence of Vitamins A, B and C in Peppermint Leaf deliver brightening and anti-inflammatory effects. Rose Hydrosol imparts some antioxidant and antimicrobial compounds with Calendula Water, Roman Chamomile Water and Lichen Extract adding more anti-inflammatory and soothing properties. With 78% of linoleic acid, Safflower Oil acts as a lubricant to prevent water from leaving the skin, locking moisture in for glowing the skin. As a result, it softens dry and rough patches of skin. Emollients and humectants are well represented in the formulation assuring skin retains moisture while Stearic Acid contributes cleansing capability. Several ingredients at the end of the list are included for preservative function and fragrance. The re:p Bio Fresh Mask With Real Nutrition Herbs is presented in a plastic jar with screw top lid. Returning a mild hazard rating, the CosDNA and EWG assessments highlight the sensitivity risks of fragrance and preservatives in the re:p Bio Fresh Mask With Real Nutrition Herbs formula. Cleanse and tone skin then apply a moderate amount of mask over the entire face, avoiding eye and lip area. Gently massage in circular motions with your fingertips. Leave on up to 10 minutes and rinse well with lukewarm water. Follow with remaining steps of your skin care routine. The re:p Bio Fresh Mask With Real Nutrition Herbs has a fairly strong fragrance of common herbs such as rosemary and peppermint. A 130ml jar of re:p Bio Fresh Mask With Real Nutrition Herbs has a recommended retail price of around AUD$49.00. 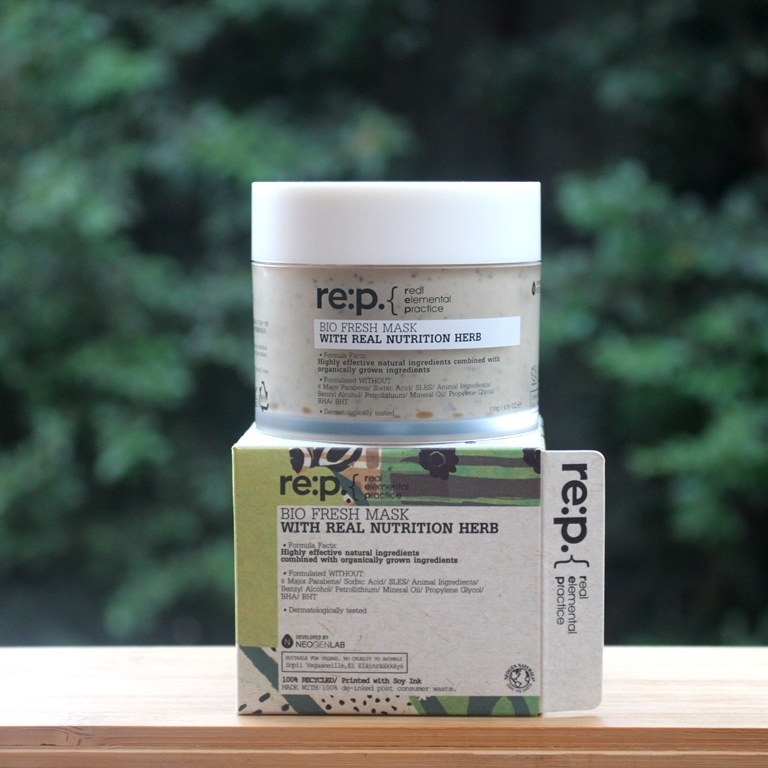 The re:p Bio Fresh Mask With Real Nutrition Herbs is widely available online at Korean skincare boutiques. I picked mine up at Aniqa. 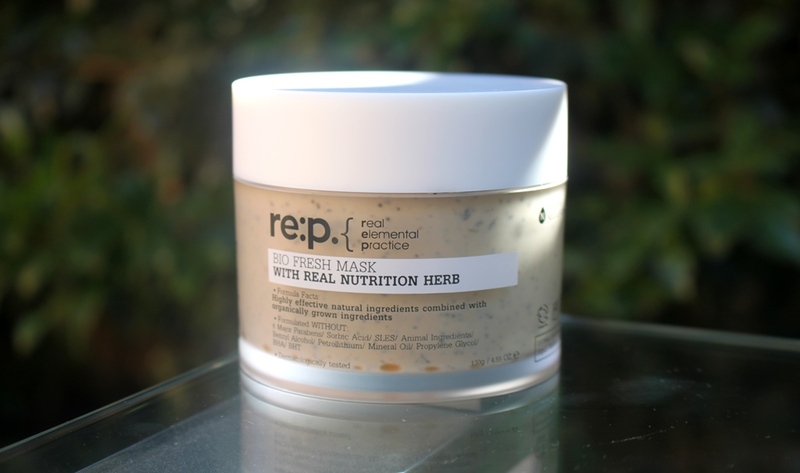 The re:p Bio Fresh Mask With Real Nutrition Herbs is date stamped with the manufacturing date. It must be used within 12 months of opening. Under the Neogen umbrella, re:p. stands for real elemental practice. The brand is focused on using sustainable practices and natural ingredients which are cruelty free. I love the look of the eco-friendly packaging of this product. The cardboard box it comes in is 100% recycled and on trend. The minimalist design and matte finish of the plastic jar is equally tasteful. There is no spatula with which to dispense the product, however given the brand’s philosophy, perhaps this is a conscious choice to avoid an unnecessary piece of plastic. They are in fact the only leaping bunny certified k-beauty brand. 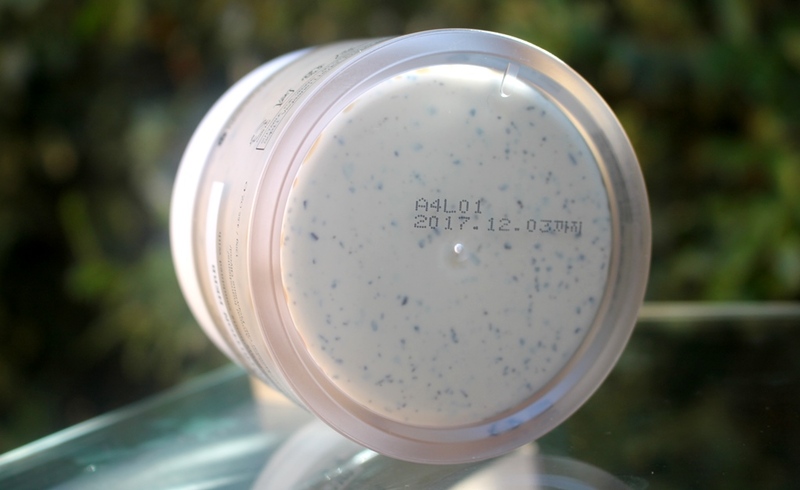 With finger application encouraged and a twelve month expiry upon opening, there are sufficient preservatives in the jar to prevent bacteria forming. I remove the product with my fingers and massage it into my skin for a couple of minutes before letting it sit. I found if I left it for 5-10 minutes as directed, I observed absolutely no effect, so I leave it on for 30-40 minutes. Surprisingly, Kaolin is included at the highest concentration after water. However, this doesn’t feel at all like a clay mask. It doesn’t dry, tighten or crack, rather remains quite moist on the face regardless of wear time. This is possibly due to the high amount of canola oil, keeping the product soft and buttery on the face. The other thing the canola oil does is make the product feel like it looks and smells – herb butter! This is probably the only thing I don’t like about this mask. 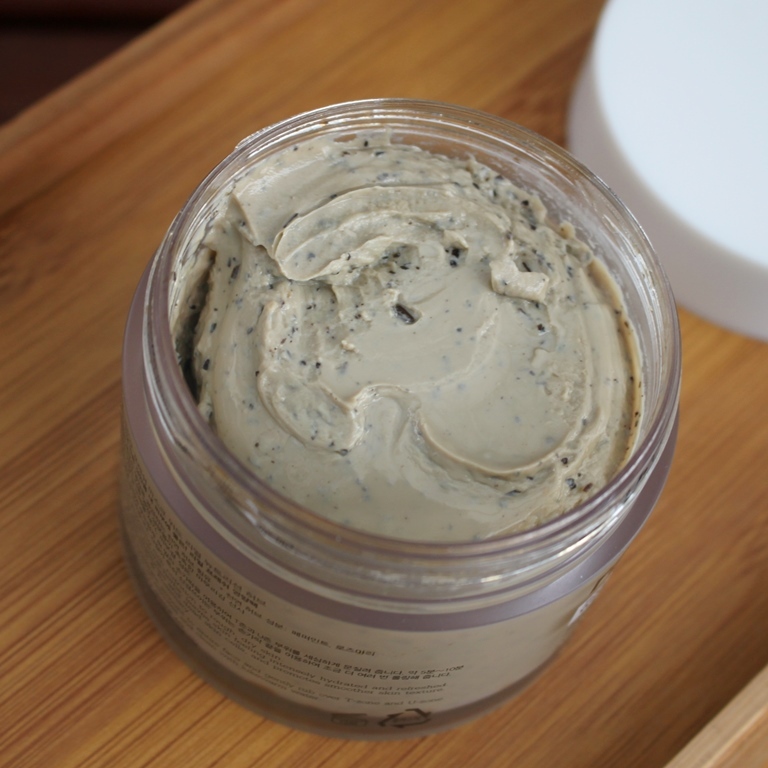 It feels like you’re rubbing softened herb butter into the skin. The greasy texture and food like scent aren’t to my taste however, once the mask is on, it stays in place and the texture and scent become less noticeable. The herb pieces in the product are 100% crushed rosemary and peppermint and are said to gently remove debris and dead skin cells during massage. The brightening effect is also attributed to the overall detoxifying/cleansing action of the mask and enhanced by the vitamin content of peppermint leaf. Removing the mask resembles the removal of butter as well. Cold water won’t cut it, you have to use warm and a wash cloth wouldn’t go astray either. I try to remove it in the shower so I can do so under running water. I give the mask another rub during the dislodging process until it is completely removed. Although a little work has to go into the removal (nothing difficult just more than a splash of water), the after effects are smooth-to-touch skin. The greasiness is completely gone, no residue is left behind. Regarding the product claims, yes, it certainly delivers an immediate brightening and calming effect as well as improving the texture of the skin with gentle exfoliation. Even though I leave the mask on for longer than recommended, although it has a fair percentage of kaolin in it, there is no drying effect, my skin feels bouncy and hydrated. Additionally, my somewhat oily T-zone feels completely neutralised upon completion. The brand recommends use for ageing skin. In my 40’s, I decided to give it a try. I think the effects are definitely beneficial to my skin so I wouldn’t hesitate to recommend it likewise. I also think anyone suffering skin irritations, sensitivity and oily skin types would get some value from this product. The former would appreciate the calming effects, the latter the purification ability. This is the first product I have tried from the re:p. line although I am familiar with the sister brand, Neogen. There are so many things to love. The brand is proudly environmentally aware, vegan friendly and in this case, has produced an innovative mask which I think is suitable for all skin types. It is gentle and effective. Although I don’t love the texture or scent, I am very pleased with the product efficacy.